This story is the first in a week-long SPACE.com report on what it would take for humanity to return to the moon. Coming tomorrow: The Case Against the Moon. 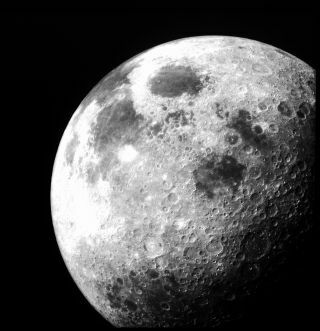 The moon, once an enticing siren for intrepid space travelers, has begun to feel old-hat to some. Even NASA has shifted its sights to fresher targets for exploration: an asteroid and Mars. But many refuse to give up the goal of sending humans back to the moon. They point to the relative ease of getting there, the deserving science that could be furthered there, and the moon's ability to serve as a testing ground for even more complicated deep space missions. "There's a special place in people's hearts for the moon," said Eric Anderson, president and chief executive of the Virginia space tourism firm Space Adventures. "We see it every night. It's a symbol of the future of space exploration and of one of the greatest achievements humanity has ever had." He is not the only one immune to a "been there, done that" attitude. "It's very exciting to me!" Peter Diamandis, chairman and chief executive of the X Prize Foundation, wrote in an e-mail. "The moon is exciting as Alaska was in the 1800s. It is a frontier where tremendous wealth will be created and resources will be extracted for humanity's expansion beyond the Earth." Some say that whether the moon is emotionally inspiring as a destination is beside the point. "If you're dependent on public excitement to determine whether something is worth doing or not, you're not going to do much," said Paul Spudis, a lunar geologist at the Lunar and Planetary Institute in Houston. "The public is mostly concerned with their own lives, rightly so." "There is a lot of good science that we've only scratched the surface on," said former astronaut Tom Jones, a veteran of four space shuttle flights, who has a doctorate in planetary science. For instance, in the years since men first walked on the moon, orbiting satellites have revealed evidence that its surface contains hidden reserves of water. Future expeditions could study this water and learn more about the complex makeup of this planetary body. "The Apollo astronauts made only brief visits to only six places on the moon, all near the equator," said Richard Vondrak, deputy director of the Solar System Exploration Division at NASA's Goddard Space Flight Center in Greenbelt, Md. "Our most recent missions, such as LRO and LCROSS, are revealing new secrets of the moon and helping us to identify new places to go, such as the polar regions." How the moon formed and evolved are still open questions. While many scientists think the moon was created when a Mars-size space rock slammed into Earth and knocked off a piece of it, the details need to be worked out, and other scientists dispute that explanation. Finally, the current absence of a dynamic surface or active volcanism enables the moon to preserve a history of all its impacts from space rocks. These impacts tell a tale of the history of our solar system – one we can't get on Earth because our planet is always changing and covering over the record of its past. "One current debate in impact studies is: Is the impact flux on Earth episodic – does it occur in cycles?" Spudis said. "The Earth's dynamic surface erases the impact record. But you can retrace the bombardment history of Earth by studying the bombardment history of the moon." Getting the answers to these questions and others could depend on sending people, rather than just robots, to the lunar surface. "Astronauts can accomplish scientific exploration that is beyond the capability of robotic explorers," Vondrak said. "Moreover, human missions have flight systems that allow for enhanced capabilities that are not possible in robotic spacecraft. "For example, the hundreds of kilograms of lunar samples returned by Apollo greatly exceeds the capacity of robotic flight systems. Astronauts can perform geological exploration and complex scientific research far better than robotic systems." The moon also gets points as an exploration destination because it is a much simpler matter to get there than to, say, Mars. "You don't have to wait months for launch windows, and it's only a three-day trip," Spudis said. For many, the question isn't, "Should we go to the moon OR Mars?" but rather, "Where should we go first?" "The moon is the perfect ground to get our feet wet for Mars," said space entrepreneur Robert Bigelow, founder of Bigelow Aerospace, which is aiming to put private space station modules in Earth orbit. In fact, our chances of making it to Mars could ride on whether we go back to the moon first, proponents say. "The moon is the only logical first destination," said William Pomerantz, senior director of space prizes at the X Prize Foundation. "It only makes sense to use the moon as a testing ground and proving ground and staging ground for missions to Mars and other parts of the solar system." NASA could practice for the Mars flight by building habitats on the lunar surface and developing techniques there to utilize indigent resources, like water, some argue. That would improve the prospects for a livable and sustainable stay on Mars. Planetary scientist Carolyn Porco of the Space Science Institute in Boulder, Colo., who leads the imaging team on NASA's Cassini mission to Saturn, said: "I'm worried that if we make a hell-for-leather push to go directly to Mars now, it'll be Apollo all over again. First we'll just squeak by in getting there. Then we'll get there, plant a flag and say we did it, and then everyone will live off that high for 50 years, and the argument will arise that we'll never have to do it again. "That's not the kind of approach to human spaceflight that will lead to a permanent human presence beyond the Earth." By developing the technologies needed to travel back to the moon and set up shop there, humanity can work out the kinks before embarking on a more challenging and lengthy Mars mission. "Some propose that we concentrate only on Mars. Without the experience of returning to the moon, however, we will not have the engineering, operational, or physiological insight for many decades to either fly to Mars or land there," planetary scientist Harrison "Jack" Schmitt –who as a NASA astronaut was the last person to walk on the moon– wrote in a statement. Plus, travelers to the moon could mine the lunar surface for commodities useful not just for building lunar colonies but for life on Earth, some say. "It has resources for exploration, and some we need here on Earth," said Tim Pickens, leader of the Alabama Rocket City Space Pioneers, a team competing for the Google Lunar X Prize. Pickens cited helium-3, which is hard to find on Earth but thought to be common in the top layers of lunar dirt. This isotope could be useful for nuclear fusion research, and many hope it could be converted into rocket fuel. "The moon's surface is rich in silicon, aluminum, titanium, and many of the rare earth metals," said science fiction author Ben Bova. "You've got raw materials for solar cells and structures." He said the silicon on the moon could be mined to build solar panels. "That's the shape of the future. I think we may see this in the next 10 to 20 years," Bova said. The recent finding of water on the moon could be a game-changer. "What I think is the most significant and most interesting about the new discoveries is the discovery of massive amounts of water at the poles of the moon," Spudis said. "It's a life-sustaining consumable." He said that water could be used for drinking, broken down into hydrogen and oxygen for breathable air, and even converted into rocket fuel. "The sooner we access these resources," said astronaut Jones, "the sooner we have a beehive of economic activity beyond low-Earth orbit." The moon could provide not just practice for future missions elsewhere, but perhaps a midway point on those journeys. Spacecraft could land and refuel there before taking off for farther destinations. Science fiction writer Orson Scott Card admitted such a project could be a political hard sell, and the endeavor would not be guaranteed to work, but he said: "I strongly believe that we are foolish if we don't establish a moon base and use it as a launch point for expeditions elsewhere in the solar system." Ultimately, the moon may represent the best chance humanity has of establishing a foothold in space. "We need to expand the human 'economic sphere' beyond geostationary orbit to the moon," Diamandis said. "The moon represents a critical platform for humanity, [a] foothold into the solar system for the acquisition of water, resources and energy." And it just might replace Florida as a mecca for senior citizens. "The moon might make a great retirement center," said Bova, who is 78. "Living at one-sixth gravity might make my aching joints feel a lot better." SPACE.com reporters Denise Chow and Mike Wall contributed to this report. You can follow SPACE.com senior writer Clara Moskowitz on Twitter @ClaraMoskowitz.